Sometimes sportswriters are asked if they root during games. It’s a slightly weird query, at least for the good ones, but if they are honest people they’ll give an honest answer. They root for fast games, naturally, because no one wants to work longer than is necessary. They root for good people, because they deserve to have good things happen to them every once in a while. And they root for good stories, as Mike Lupica of the New York Daily News wisely pointed out, because they all are storytellers at heart. That fact made the Stanley Cup Finals a difficult proposition in terms of a rooting interest this year. Both teams were great stories. The Vegas Golden Knights in the Finals? A first-year expansion team? Preposterous. Almost as ridiculous as hockey in the desert. Who were these guys? They had a goalie in Marc-Andre Fleury who was cast off by the Penguins at the age of 32 after winning 375 games and three Stanley Cups. He was joined by a group of fellow “rejects” who would have been tough to identify in the hockey equivalent of a police lineup. Maybe it was the mass shooting in Las Vegas shortly before the start of the season that united team and city and allowed everyone to feel good about something. It’s happened before, such as when the Red Sox won an improbable pennant in 2013 after the Boston Marathon bombing. Whatever the reason, General Manager George McPhee and coach Gerard Gallant broke a team together in September and had it playing for the Cup in June. It was the type of performance that should be remembered for decades to come. 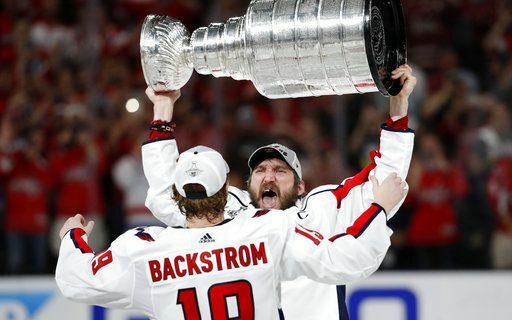 Yet, the Golden Knights must take a back seat to the Capitals in the area of “the best story.” We like our championships to come with some history, preferably with a little suffering along the way. Maybe the Cubs overdid it in that department, but it’s nice to players and fans earn the ultimate reward in sports instead of having it drop in their laps. Washington has had a variety of eras over the years, neatly packaged for whatever reason. The team’s very first year, 1974-75, set the tone. The NHL had been expanding quickly in the 1970s, as the war with the World Hockey Association was draining everyone of money. There were only crumbs left in the Caps’ expansion draft, and they didn’t do a particularly good job of picking out the good ones off the table. Washington finished 8-67-5 that season. The Caps scored 2.26 goals per game and gave up 5.58 goals per game. That deficit of 3.32 goals per game is one of the worst such figures in history. Maybe that’s why defenseman Bill Mikkelson was a dumb-founding minus-82 for the season, the worst ever. Then again, Tommy Williams was a minus-69, and he was the team’s leading scorer with 58 points. The Caps had three coaches that season, and none of them did well. They gave up 10 goals in a game seven times, and allowed nine goals to the Sabres twice. You don’t dig out of a hole like that easily, and Washington missed the playoffs for its first eight straight seasons. The Capitals had a rare good moment on April 2, 1978, when they tied the mighty (59-10-11 for the season) Montreal Canadiens, 4-4, at home. As you’d expect under the circumstances, all three stars were from Washington. The Capitals finally put together a nucleus early in the 1980s, with such players as Dennis Maruk, Mike Gartner, Rod Langway and Scott Stevens. But they were never quite good enough or had mediocre goaltending, and only got past the second round once after making the playoffs in 14 straight seasons. The Capitals missed the playoffs six out of 10 times after that – one of the “makes” was an unexpected appearance in the finals in 1998 led by goalie Olaf Kolzig. Better times were expected with Alex Ovechkin arrived as the first overall draft in 2004. It took him a year to debut thanks to the lockout, but he scored 52 goals as a rookie. The Capitals needed a couple of years after that to collect talent around him. Starting in 2007, though, the Caps played 10 full seasons (one year was shorted by labor problems), and they had 90 or more points in all of them. In fact, Washington led the entire league in regular-season points in that span … and had no championships to show for it. Not only did the Caps always lose in the postseason, but they did it early and creatively. Washington never got out of the second round in that span, and often wasted early series leads or made big comebacks that fell just short. The Caps piled up 120 points in 2015-16 and 118 points in 2017-18, and still didn’t reach the conference finals. Was their window of opportunity closing? No. The Caps beat the Blue Jackets, Penguins and Lightning in tough matchups before Vegas, and this time they climbed through that window. Ovechkin was named the MVP of the playoffs, although you could have made a case for a few other players. Still, he finally got his championship ring. In a spectacular career that didn’t need any validation, the forward found a little of that quality by winning a Cup. Ideally, every team should win a championship about a generation apart, so that the glory is passed around. But being a sports fan contains no guarantees, as those in Buffalo know all too well. Sabres and Bills fans, therefore, are happy to be reminded again that nothing lasts forever, even championship droughts.